Sod’s law (or Murphy’s or irony- whatever you want to call it) – I’m due to meet the bus to take us to the airport at 10 a.m. and after yesterday’s taxi debacle I’m feeling ultra cautious. In addition to my trepidation about visiting the Democratic People’s Republic of Korea (as they misleadingly call it) anyway, when it’s on the news every day and there’s an ongoing standoff with Donald Trump. It will be very isolated – there is no internet access and you may not enter other than on an approved tour. Everyone I’ve told thinks I’m brave (or mad) for coming. The hotel orders me a taxi at 8.45. It arrives immediately and I’m over an hour early for my next adventure. It seems like a huge group of us setting off. There are two main tours of about 15 people each. The short May Day Tour and the long May Day Tour. I’m on the latter. An Australian, a Kiwi (definitely gay), Brits, two Croatians (probably gay), an Italian (almost certainly gay), two young Finns (maybe gay), a young German who doesn’t really speak English (possibly gay) and one very nervous American – nearly all male. (This is likely to be a very intolerant society so I’m a little surprised at the potential for a stressful holiday choice. Brave people!). There’s also a few folk doing independent tours –they seem to be Dutch. At least we would set off if the bus had turned up. But it hasn’t. Apparently, it has gone to the airport instead. We are hastily bundled into taxis. But it’s very slow going up the expressway. The world and his wife are on the road for the May Day weekend. When we do finally arrive I resign myself to another day of queuing. The queue to check in for Air Koryo, the Korean national airline, moves exceeding slow –it’s all done manually, even though we are already very late. And the queue for security and immigration is even slower. We are ‘fast tracked’ twice as our plane is due to leave whilst we are still navigating the throngs and having all our belongings removed and microscopically examined. Eventually the plane takes off, an hour late. The livery is seventies red and white. We fight for a copy of the famous monthly propaganda journal Korea Today and we are fed the famous Koryo burgers (they feature in newspapers regularly – the only inflight refreshment on offer. The meat’s origin is unidentifiable and the vegetarian option is to remove the ‘meat’ –or don’t eat. The burgers are cold and chewy and don’t really taste of anything. So I’m told. I just take photos of mine. And it’s a really bumpy ride. The plane judders- it’s an old Tupolev, one of only two that are allowed into China. They aren’t allowed into Europe at all. It’s explained that they are designed for flying rather than comfort – I wish I hadn’t packed my Rescue Remedy in the hold. The rest of Air Koryo doesn’t seem to do much except sit on the tarmac, swathed in bibs, giving the illusion of a fleet. I have spent ages purging my laptop of anything that I think may not be permitted- videos, photos of South Korea, the American flag. In the event Korean customs procedures are not too tortuous at all and my laptop is not examined. Much friendlier than Chinese security. We are met by our guides, who confiscate our passports and visas. 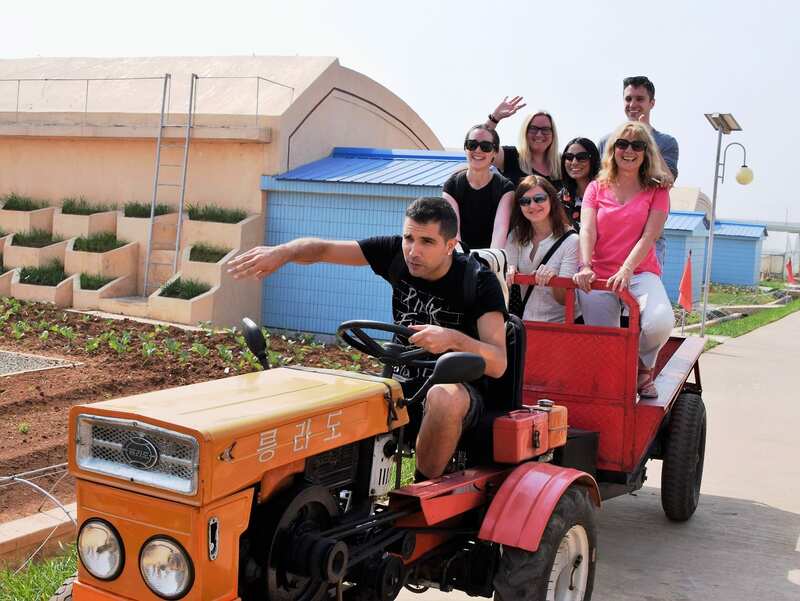 Time for a quick tour in the capital, Pyongyang, after speeding past paddy fields and pastel pink apartments. We enter via the Arch of Triumph, built to celebrate victory against the Americans, as are most memorials here. It’s more rectangular than the French one and a third bigger– of course. There is little traffic in the way of cars, though there are six lane highways. Four cars is a traffic jam. There is a steady stream of cyclists in the bicycle lanes. The city itself is modern and colourful, (it was virtually razed to the ground during the Korean War) with wide streets and pop art meets art deco scrapers. There are numerous splendid buildings, stadia and halls, civic, cultural and sporting. Uniform is common, though I haven’t yet worked out which colours signify what and we’re not allowed to take photos of the military (or buildings being constructed as they are ’imperfect’ or ox carts as they make the country look poor) so I’m being even more ultra-cautious. The peaked hats have high brims and the crowns are padded so they appear large and distinctive. On a corner a traffic officer in blue systemically performs a robotic sequence of movements that involves moving her head from side to side and wielding an illuminated baton. She also has flashing lights on her hi-vis jacket. We stop by the river to photograph squares and columns and towers. There are white crosses in lines on the main square to indicate where soldiers will stand for the main parades. My group has one leader from our tour company and three Korean guides. They keep us moving around quickly. The guides are constantly on the phone to their directors – national security regularly updates edicts on what we are and are not allowed to do. The latest directive states that tourists may no longer visit the statues of the two deceased members of the familial dynasty that effectively runs the country. Giant statues of Kim Il Sung (referred to as eternal president) and Kim Jong Il (referred to as eternal chairman) are a feature of every town and large photographs or paintings of the duo adorn most buildings and streets. We are expected to pay our respects by lining up and bowing formally when we enter the buildings. The current ruler, the supreme leader, or chairman, Kim Jong Un is ‘too humble’ to be deified as a statue, except occasionally as a child, in this atheist state, but he features in numerous photographs. Naturally, all of us tourists are very distressed at these instructions, as the main reason everyone has come is to see the propaganda and get their own perspective on Kim Jong Un and his reported self aggrandisement. We are told that leadership is very sensitive. The people certainly seem to venerate their leaders, even if they look a little anxious as they do so. One of our long list of instructions is clear that, should we get near enough to photograph a picture of a statue, we must include the whole figure – absolutely no cropping. We are observed with great vigilance to ensure that we comply. We are allowed to peer at central Kim Il Sung Square from across the street as dusk falls. We are forbidden to take photos of the shops lining the main road here. There are goods in the windows but very little inside. Then to our tourist hotel, located on an island where we are exhorted not to leave the grounds unaccompanied. It is 47 floors high, reminiscent of Soviet Russia, and has a revolving bar on the top. The lift doesn’t have a button for the fifth floor though the information adjacent to the controls says that this is the communications floor. My guide book (which I’ve not been allowed to bring into the country) has already told me that the lift is bugged. I wonder what else is wired if a whole floor of the hotel is taken over for listening. Perhaps I should run the tap in my room if I have any visitors. My room is a sixties throwback. It has a safe and a fridge that don’t work and great views over the city to the supreme leader’s pride and joy – the rocket shaped Ryugyong Hotel dominates the skyline. It’s huge. I’m also already beginning to learn that everything of importance in the DPRK features a missile/rocket. Buffet dinner is in the pink and white banqueting hall and we are not allowed to enter without our guides. The best description of the food is probably ‘adequate’: fried rice, chicken, pork, sardines and a bit of salad. There’s beer too if you want it. I’m told it’s good. We are woken by martial music blaring from speakers at 6 am. A group of workers is jogging and chanting along the river embankment – I can hear all this from 22 floors up. I wanted to ignore the media reports of fakery and make up my own mind about ‘the most secretive country in the world’. But it already feels as if I’m participating in The Truman Show. There are folk going about their everyday business, cycling, walking, but very little feels purposeful. It’s easy to see all these people as playing bit parts, wandering on and off the set to calming piped music. If not in uniform the city women are very smartly dressed in tailored suits and high heels. There is a board with suggested hair styles on the salon wall. The men wear jackets. We have brought smart clothes ourselves as these have to be worn to visit The Kamsusan Memorial palace, burial place of the two dead leaders. However, the visit is off, along with the statues. Instead, we visit a cooperative farm run by working teams from several villages. We’re told they receive food in quantities dependant on the work points they have accrued for effort. This farm seems to consist of some plastic covered greenhouses containing tomatoes and cucumbers. I’ve seen these at most meals already. Other vegetables seem to be in short supply. There’s nobody working at the farm, though locals appear to show us round and a worker conducts a tour of his tiny house. A head keeps popping above a parapet and then disappearing – organisation or surveillance? Either feels weird. Next is the Hall of Gifts – four floors of glass cases displaying presents to the leaders from Koreans and other nations. Much of the symbolism involves the leaders riding tigers or alludes to their heroism in other ways and I might have had difficulty concealing my amusement at the vulgarity and ridiculousness if there had not been so much ivory, tortoiseshell and other endangered species involved and if the many gifts had not been described in quite so much detail. I’ve opted for a helicopter ride over the city which I booked before leaving the UK. I’m not so keen now I’ve seen the air fleet and I blag a Valium from Kiwi Steve. Steve has bought a camera rig in Beijing and films absolutely everything we do – and I mean everything. Naturally, this is attracting some attention from the authorities. Our flight is preceded by a lavish banquet of five courses and the ride itself is actually very comfortable. True, it is a converted military helicopter but it seats a dozen or so and has been fitted out with plush seats. There is a steward who sits and dozes, as does the guide who accompanies us. Free to take pictures of whatever we want, despite previous strictures not to photograph outside the urban area, disappointingly there doesn’t seem to be anything too unusual to report. The city is impressive and modern except for two enormous power stations belching smoke into the air. No wonder it gets a little hazy at times. Even so, the pollution is never truly awful- there are so few cars. Back in the city we get another view of the many apartment blocks and scrapers from the viewing platform at the top of the Juche Tower. Juche is the (at times incomprehensible) philosophy expounded by Kim Il Sung, but the word literally means self-reliance and the tower has an illuminated torch at the top. There are gardens and fountains – very pleasant as long as you stay near the guides. The subsequent stop is Kim Il Sung’s birthplace at Mangyongdae. This is a venerated but frankly not very exciting traditional house. Next door is a Fun Fair – you will enjoy yourselves- though it seems very quiet. There are only tourists on the rides here, the usual dodgems, roller-coaster and big wheel. The centrepiece of the chair carousel is a missile. Our final activity before dinner is a visit to Kwangbok Supermarket. It has three floors of goods-some bright clothes, aisles full of crisp type snacks and mineral water and some frozen goods. Whole fish thrown into freezers unwrapped and a few decapitated turtles in a tank. Even though there are several tourist groups and other companies it seems that we are all corralled together for activities (so much for it being a small group tour). Because it’s simpler to organise or to keep an eye on us more easily or because everything we see is rigged, it’s hard to know. Do the locals really go out to eat or are just a few sent to fill up the empty tables where we go to prove that everyone has a good time in the DPRK? Whatever, it seems that ability to do karaoke is a prerequisite for a waitressing job. They are very slim (as are nearly all North Koreans) wear short skirts and at a given signal abandon their waitress duties at every meal to go onstage and mime and dance to songs that we quickly come to recognise. The DPRK version of the Spice Girls often feature. The food hasn’t improved. There’s the usual rice and kimchi (pickles- most commonly cabbage); much of it is cold – chicken, fried fish. Today we are joining in with the local celebrations. We visit another Fun Fair in Taesongsan Park (what a jolly time the locals have here) and today there are organised games. It’s like a school sports day with sack races, hoops and balloons. These finish with a tug of war. Mass dancing is promised on the programme – like a huge line dance- but it doesn’t materialise. Apparently it happens spontaneously, pop up style, and this is proof that these events are not put on just for tourists. I’m not convinced by this logic; it sounds too convenient an explanation for not having organised something. And we have criss-crossed the city countless times already. This has the double advantage of making Pyongyang appear much larger than it actually is and of being disorientating. We do get to see dancing in this park, however, as groups of ladies sway in a colourful group round large speakers. Later, there is additional karaoke on the steps of the monument. We climb another hill for views. The area is jam-packed with picnickers all, apparently, having a riotous time. This is where events really do appear choreographed. I’m not suggesting that a hundred thousand people have been organised to come out and perform (am I?) but it is clear that the parties along our path have been orchestrated. Everyone has very similar food and accoutrements: barbecue with squid, fish and meat laid out in the same way. We can see the people signalling to each other that we are coming and as we approach they leap up and sing and dance to their sound boxes, smiling broadly, even encouraging us to join in. Koreans on the street are polite but much more wary, especially the schoolchildren. Our next treat is a trolley bus ride. Only tourists allowed on this one. We travel down the street we have just come up in our coach. Then we go to the circus. (Every moment is ‘fun filled’ and we don’t get to stop at all. It’s pretty exhausting). The trapeze artistes, acrobats and jugglers are impressive and the arena is full of clapping military men. It’s almost dark when we drive south to the ancient city of Kaesong near the border and the road surface, though wide, is truly appalling. Full of potholes, our own free roller coaster ride, with just glimpses of villages and workers in the paddy fields. It’s virtually impossible to take photos outside Pyongyang, even when we are allowed to. (No military check points please). Much of our travel is done at dusk and when we can see anything the bus is jolting so much that all I end up with are blurred pictures and a bruised nose. The Minsok Folk Hotel is off. It’s being ‘refurbished’. This is one of several excuses that gets recycled. I’m not heartbroken. We were promised traditional style sleeping on the floor. But the replacement is the sort of hotel you don’t want to inspect too closely. There’s no shower, just a bowl in the tub, and hot water for two hours a day. However, it has heated floors under the tatami matting. And we are staying in the most luxurious places. No-one, other than tourists, utilises these hotels and they seem deserted when the tourists are diverted elsewhere. At dinner we are offered sweet green bean paste pancakes, which are rather good. Dog meat soup is a spicy optional extra. I draw the line at that one. I’m woken by more early morning music. Out of the window a group of yellow uniformed men squat round some bushes. I’m not sure if they are supposed to be gardening, but they are not accomplishing much. One of their group is parading up and down watching the hotel. He turns away when he sees me looking. After some negotiation we are allowed to walk past, but not visit, the huge bronze statues at Kaesong and there are good views over the tiled city roofs. We make two visits to the Demilitarised Zone (DMZ), broken up by a lunch that is served tapas style in about twenty small gold dishes, with soju, the local rice wine. It’s interesting viewing the DMZ from the other side and hearing the conflicting stories. The first visit is to the UN buildings at Panmunjom where the armistice was signed. There are photographs of worried looking American officials at talks, heads in hands. The second is to a viewing platform where we get to look through binoculars at what the North Koreans say is a concrete wall demarcating the whole of the border. The South Koreans swear it doesn’t exist and our guide has trouble locating it. She asks the guard.. I can make out bits of something through the lens. I couldn’t swear it was a concrete wall, and there only seems to be a small section of whatever it is. There is enforced karaoke on the bus going back to Pyongyang. I feign sleep. Back at the Pyongyang hotel we are given the same rooms as before – apparently we always get the same room. It doesn’t look as if anyone else has used it. And I suppose it makes it easier for the men in the communications room to operate. It is now very clear that Pyongyang is very different to the rest of the country. It is far more affluent and privileged and is being developed as a show piece. We are being kept well away from poorer areas. 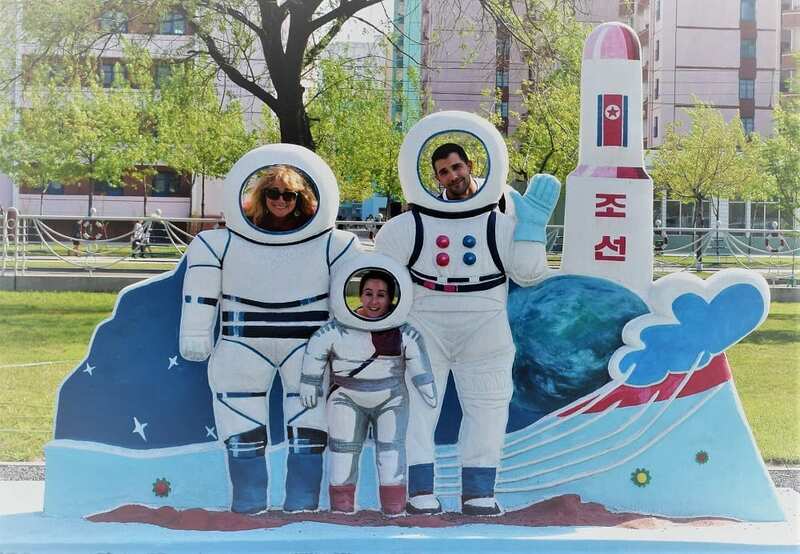 The people are very restricted in their own movement and stay where they are born, and with the lifestyle into which they are born, unless they show some talent – in which case they might be brought to Pyongyang to be educated and to work. Today, we begin with the Victorious Fatherland Liberation War Museum (interesting historical hark back here.) There are numerous soviet style statues commemorating the war and a female member of the military tells us all about how America sneakily started the war, but was quickly repulsed. The U.S. they say, dropped 484,000 bombs on Pyongyang – more than one bomb per head of population. One of our guides adds that some of the bombs contained bacteria and insects. Mosquitoes and cockroaches were unknown in the DPRK before the war. Even the other guides look a little uncomfortable about the passing on of this particular piece of propaganda. We are shown rows of tanks, guns and bits of American planes. I’m no expert, but at least some of these look more like World War II vintage than early fifties to me. Next we tour the USS Pueblo, where the account of the ship’s activity, capture and handling of the crew in 1968 is very different to the American version. It is moored on the river bank here and officially remains a commissioned vessel of the United States Navy. We are then marched in by twos, to bow to the painting in the doorway of the main museum. The diorama and simulations in the museum are well done and very lifelike, if somewhat gory and jingoistic. Next, an art studio which is mainly a sales exercise for uninspiring landscapes and flowers, before a ride on the metro. This does seem to be utilised by real passengers, and is busy. We visit three ornate stations – like Moscow, but deeper and gaudier – with the obligatory statues and paintings of the leaders. Apparently, it’s so deep so it can double as a nuclear bunker. The fun event today is a visit to a water park (like the fairs there are several of these in Pyongyang) complete with water slides and wave machines. This is crammed with locals having a good time. Though (as is the case with most of the facilities we have visited) there is no running water in the toilets. An extra is a visit to kindergarten, clearly for very privileged children. It’s full of very expensive and unsuitable equipment, arcade games, electric horses and swings and themed areas with animals and seaside. There is little sign of any material to support language development or any teaching going on. But there are small rooms in which children are practising calligraphy, sewing, dance and music. There’s also a picture on the wall of small children smiling as a missile whistles overhead. Then we are treated to a very slick and well rehearsed performance of singing, dancing and instrumental work. The little girls give excellent Shirley Temple performances and both sexes are wearing make up. Another bumpy dusk journey to Nampo, on the western coast. Here we have a hot springs hotel. This again doesn’t bear close inspection. The villa rooms are roasting, I think they are heated by the thermal springs, and in the evening, for an hour, the water is diverted to tubs in the rooms, so I can have my own private spa. Dinner is preceded by a clam barbecue. The clams are prettily arranged in concentric circles on a large metal tray. Then the driver drizzles kerosene over them and lights it. The clams unsurprisingly burn your fingers and taste rather too much of spirit. Six is plenty. One of our number and the driver are happy to eat the rest. I have six lights in my room – one of them works so I suppose I should be thankful. And yet again there’s a faulty cistern that won’t stop running. Plenty of pillows are necessary to mitigate the rock hard beds and block out the sound from the toilet. 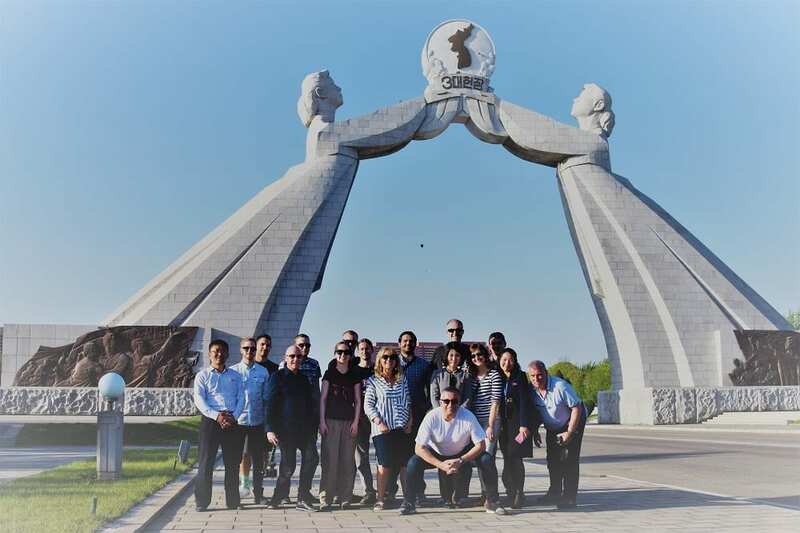 We admire Kim Il Sung’s project – the western barrage – an intricate system of dams which provides the necessary water to irrigate the fields and watch a film telling the story of how it was constructed. At least half the group fall asleep. Onto a mineral water bottling factory. Unfortunately, it’s lunch time and it’s not operating. After much protest on our part half a dozen workers are rounded up and they try to remember how to switch it all on. Eventually, the conveyor belt rattles into operation and we watch a few bottles being filled and labelled. There don’t seem to be any storage or delivery facilities and the only mineral water we have seen in the shops was in blue plastic bottles. These are green glass. Back to Pyongyang for a picnic lunch on picturesque Mount Ryonggak. Except that it’s really just some sort of terracing with waitresses who set up Korean barbecue for us. The tourist who ate all the clams yesterday sits at our table looking very green and making dives into the undergrowth. Georgio, the gay Italian, who is usually great fun, is pouting and having a grand tantrum because it’s not a proper picnic and all the other tourists are sitting on the same terrace with us. The squid is good and there’s plenty of it with all these abstentions. The afternoon is spent in Pyongyang visiting a film studio. No-one is making any films but there are sets to wander around and you can pay and dress up. If you want to. Then we visit a Children’s Palace –for extra curricular activity- which is just like the kindergarten but for older children. There are missile shaped toys here to ride on and play in and another extremely polished performance in a large auditorium with a West End standard equipped stage, attended by most of the school. Again, most of the performing is karaoke style with videos playing on the back drop. Quite a few of these feature planes, boats and – you guessed it- missiles. Some of the tourists have paid for artificial flower bouquets to present to the students, who just recycle them. There are disapproving looks if we don’t bring presents ‘for the children’. We were also encouraged to bring presents for the guides, in addition to the very strongly worded statement that there is an expectation of a very large tip. Today’s fun event is a beer bar. Again, crammed with locals having a good time. But the bar staff manage to find a gin and tonic, so all is well with the world. Now we’re off again and out of Pyongyang to a satellite city called Pyongsong. The newly renovated hotel here hasn’t got any lifts. In Pyongsong the conservatory of performing arts is off, but we do visit yet another school. This one is for gifted and talented science students. They are nearly all male. The vice headteacher (sic) informs us that unfortunately there aren’t many talented girls in Korea. Here at least we do get to visit what look like proper lessons, even if they are very directed and didactic. The students are clearly very patriotic, compliant, and respectful to their teachers and work hard. The boys say that their ambition is to help their country get strong. There are quotes from the sayings of Kim Il Sung on the walls. I’m not sure that they actually make sense. Perhaps they’ve been badly translated. A late addition to the schedule is a visit to a food factory. There is a shop with a variety of products on display, but it’s unclear whether they are all made here. They vary from crisps to bottled drinks. Nothing is operating. They say it is closed for maintenance today. More protests and more rounding up of workers. We watch biscuits being made and get to sample them hot. They are stamped with WFP- World Food Programme. Other glazed production areas look unused, dusty and deserted. We are not allowed to visit the statues in the central square as per the programme, but we do go to Kim Il Sung’s early workplace ( I think that’s what it was, I lost track during the explanation)), where there is a group statue we are allowed to bow in front of. There are a proliferation of weddings here and queues of school children on an outing. One of them is brandishing a full size plastic AK-47. We return to our Pyongsong hotel for lunch, which is virtually identical to breakfast and dinner. All feature cold fried eggs. Then back to Pyongyang to see the science and technology centre built around a central ‘rocket’. There are banks and banks of unused computers, well monitors, I can’t actually see any CPUs, and some interactive maths and science games, some of which involve guns and missiles. Fun for today is a visit to the tenpin bowling alley. The lanes are a little shorter than the ones at home. Finally, a walk up newly built Future Street for a close-up look at some of the more stylish high-rise buildings. Our last meal is in a pizza parlour off here. Predictably, the pizza is not very nice. It’s baked in an electric oven and production is interrupted by the karaoke call. I’ve opted for Korean rice and barbecue. It’s very good. The group assembles for a last karaoke performance of our own in the hotel basement. There are four microphones, so if anyone can actually sing they get drowned out. There is soju and sparkling water and the room increasingly fills with cigarette smoke. It’s a fitting end to a unique experience. 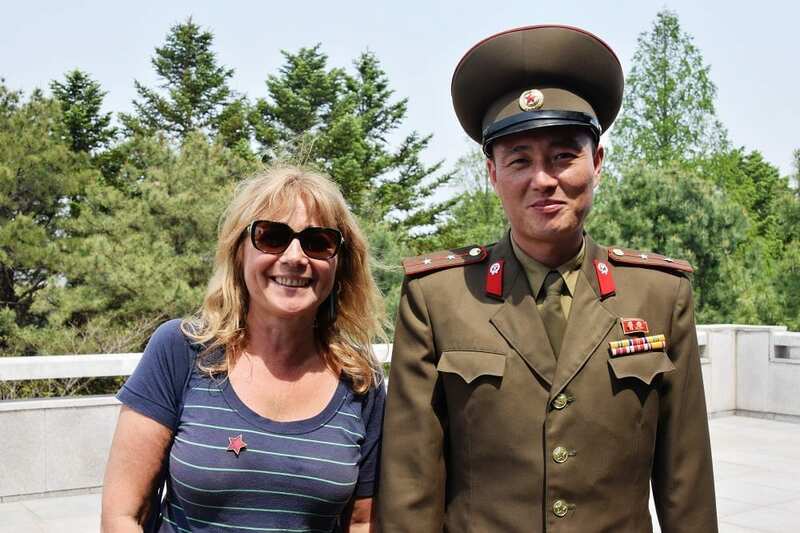 To see more of my photos of North Korea, visit this page. Leadership is venerated above all else. You are expected to formally bow to paintings and statues of the supreme leaders- past and present. If one person violates a law or is sent to prison camp, it affects their whole family. Grandparents, parents, and children of the violator are sent to work with them.